Now registered, but not well defined. Unknown parentage. Flowering to 1 metre tall. Plant purchased by Brenton Cadd from Paradisia nursery in Melbourne and discussed at the Tillnuts get-together in Apl 2010. It has links to T. rodrigueziana as with so many other imports made by this company from Guatemala. In 2012 when Bruce Dunstan flowered it again it was decided to give it a name because offsets meant it was being grown throughout Australia. 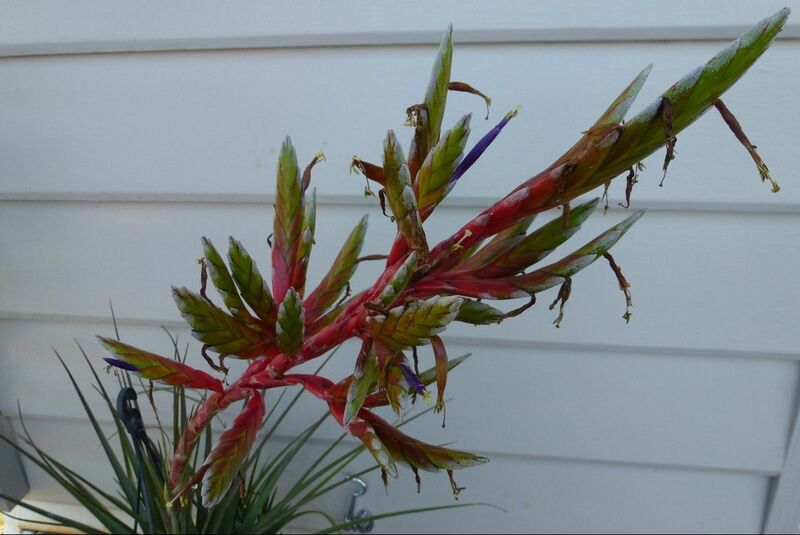 The inflorescence on Bruce Dunstan’s plant is clearly twice branched but whether this is caused by Bruce’s feeding regime is unknown. We wait for other reports. 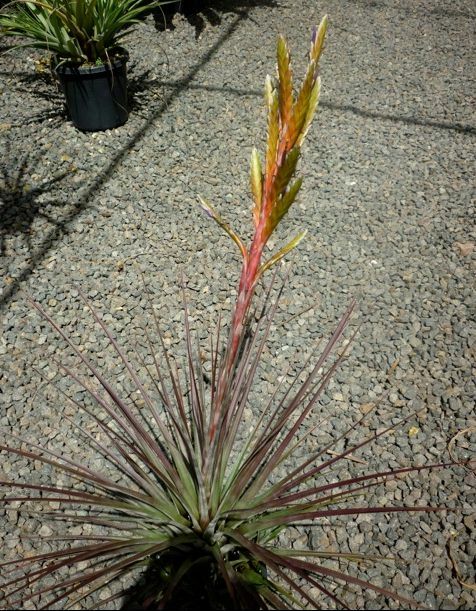 This plant is not to be confused with Tillandsia ‘Roy Ford’, yet another probable T. rodrigueziana hybrid. Notes from the "tillnuts" discussion group. Please contact webmaster if further information becomes available. Just to add to the flurry. I took these a couple of weeks ago and thought about posting them. Are they tricolor? The much brighter and more branched came from Chris, of course!. Bruce: I don't think so. The good old DVD gives us some clues but the description by Smith includes T. botteri which we now know can have a branched spike like yours. So if we ignore this sort of inflorescence we are back to a single spike as is shown in the old paintings of T. tricolor. Alas T. botteri is endemic to Vera Cruz and the description does not quite fit. For example your inflorescence is twice branched. T. rodrigueziana is also a candidate but this has sessile branches (no sterile stems like yours). I guess it is either an undescribed species or a hybrid unique to OZ. I understand that it came in when Brent worked at Gardenworld. So to save the angst every time this flowers why not call it 'Brent' so we can record its history. Chris: You have been awfully quiet on this one. 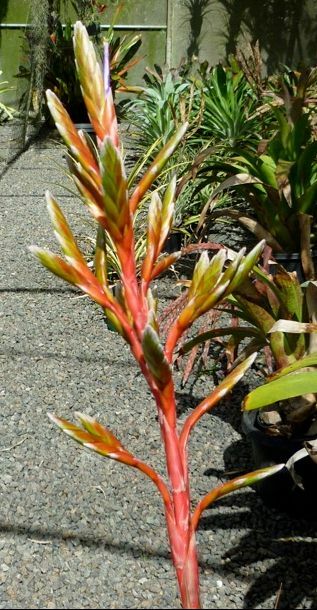 Are you going into print telling Tillandsia growers that the branched Tillandsia tricolor from Gardenworld should be called T. botteri sensu Till? Or should we give the name 'Brent' to this uniquely Australian plant where we do not know the source and it does not agree with the description of T. botteri ( even the amended version). If we went the cultivar way at least its history and details could be recorded for future growers to read. 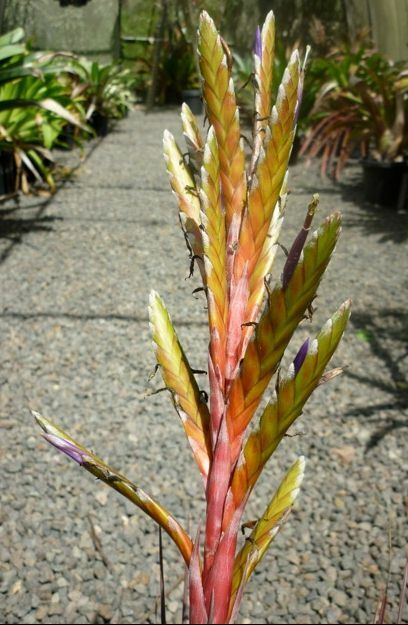 There is nothing on this saga on the BinA site where T. tricolor with branched spikes suggest T. botteri to me. Perhaps others can look at this so that Ian can correct his record. The photos by Ken Woods show 'large' which is how I got my T. tricolor' large from Maurice years ago. I have already changed my labels on my plants to T. botteri. Hi Derek: I've probably said enough on this plant. We hold very little stock of this plant - pups like crazy, so some other nutters probably have as much as we have. Taxonomy isn't my strong point, and you and Peter have looked at this plant in detail, closer than Walters assessment of a photo - so I'm happy with your call. Brenton: HELP. Your plant looks like T. botteri and to my mind is different to the one that Bruce Dunstan sent us of a T. tricolor he had got from Chris. Would Bruce please send it again because I have mislaid my copy. His was twice branched! It would seem a waste of time changing the name on your plant to 'Brent'. But has anyone looked at BinA under T. tricolor? I enclose photos that I think are closer to the species. the non painting is mine! I think the branched specimens on BinA are safer under T. botteri - comments please. Hi Derek: Images again. I couldn't remember where we were with names so far. The plant in Peter's doesn't seem to be as green as Bruce's. I have grown T.Brent in a few places & it hasn't become "green" - though Bruce's plant has possibly just been watered, or just in the photo..... But T.Brent looks vegetatively like the plant on the right. Now off on a tangent: I have a plant (ex Guatemala approx 1-2 years ago) which has been passed around to many members of this group, and I would have been sure to make sure Bruce got one when he visited, as this is the sort of thing he likes - it has green foliage with brown scales, wider leaves & I have (wildly) speculated that it may be a rodregueziana-ish thing. The couple I have left are becoming huge plants, but I'm yet to see a spike. The chances are that Bruce's plant may not be "T.Brent". The newer plant also has a more open rosette like the plant in Bruce's photo. Maybe I should gas one. We have so many things coming through - which may be different, maybe not, I just try to get a few into the hands of the collectors. I should have a numbering system like Bertie, but every time I have tried - the factory workers re-organize/throw them away. Derek: Having just had a look at Bruce's photo's again, from a distance I would say that they are the same plant as mine except for the one on the left having the twice divided flower spikes. The one on the right has a once divided flower spike and I would say that it was the same as mine. 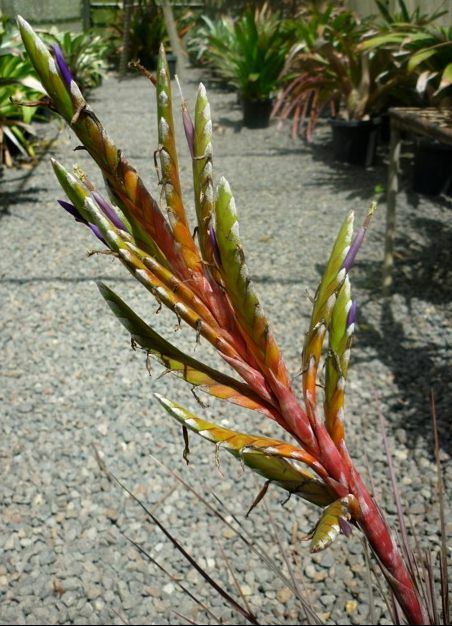 Perhaps the twice divided flower spike is a sign of a good growing culture and perhaps better fertilising. Can Bruce dissect the flower spike and compare with mine? Chris\Derek: apart from the different colour of the foliage in the different photo's I would say that these are all the same plant as the flower spikes are all the same to my eye, even Bruce's one with the twice divided spike. Chris, Bruce says that he got these plants from you originally, have you ever flowered one with a twice divided flower spike like Bruce's? 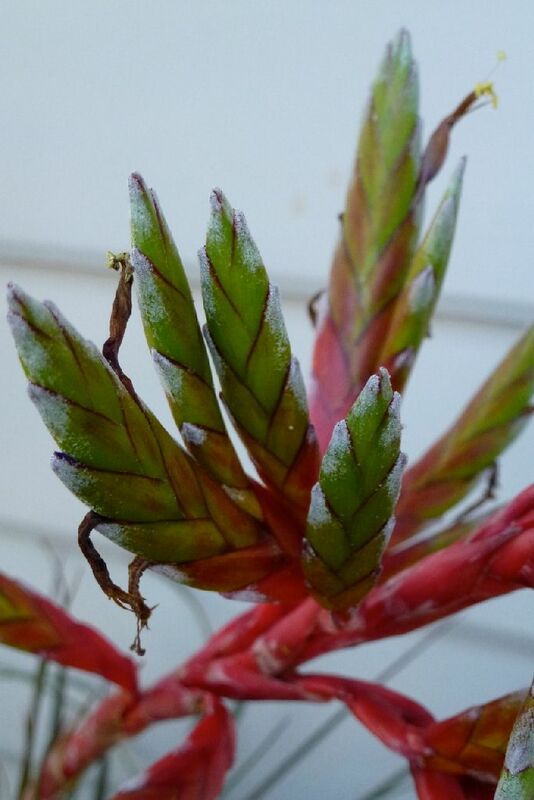 If not it might be that Bruce just has a better growing environment and grows them so well that the flower spike gets a chance to develop further. I have seen plenty of poorly grown plants along side well grown plants and the difference in flower spikes can be quite amazing. Chris\Bruce: You are not the only one confused about the identity of your plant. From what we have seen from Brent the branches on his plant are long and like what you would expect a T. botteri to be ( in other words a branched T. tricolor.) In your plant the branches are short and each branch is branched which I see as a significant difference. Is it a cultural difference? Other nutters can compare Brent's photos with those of T. tricolor on BinA and give me their opinion and if they got a plant from Chris L that flowers the same as yours. I have dropped the idea of calling a plant 'Brent'! >:-} His plant links with T. botteri! 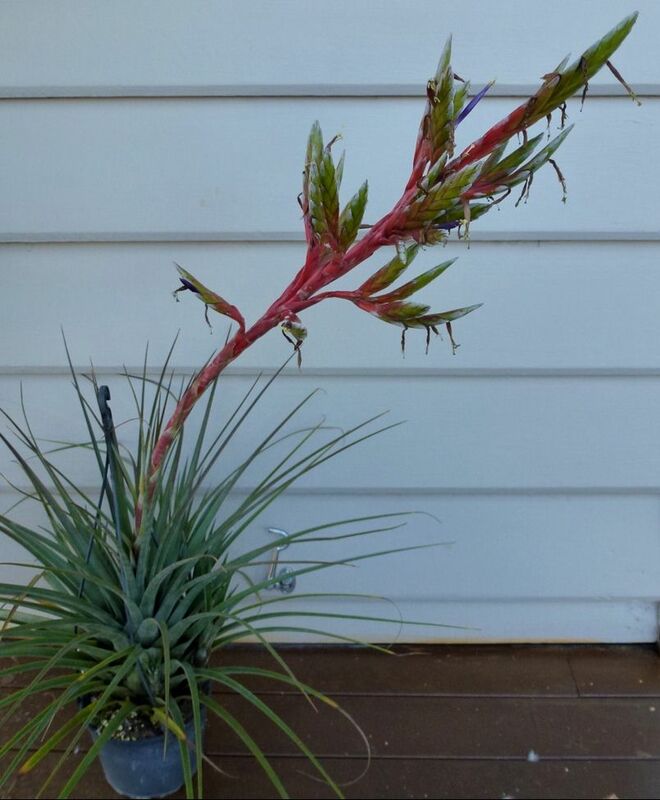 Could yours be the only one with this unique form of flowering? Is it possible yours is a Sport and we will need to see if the offsets flower the same way. If so, in 5 years time we may have to call your plant 'Bruce'! Back with images of the plant in question. I'll take photos of the other unbranched plant tomorrow. Hi. I'll do some photos tomorrow. I think Derek is on the money with his differences in the spike. 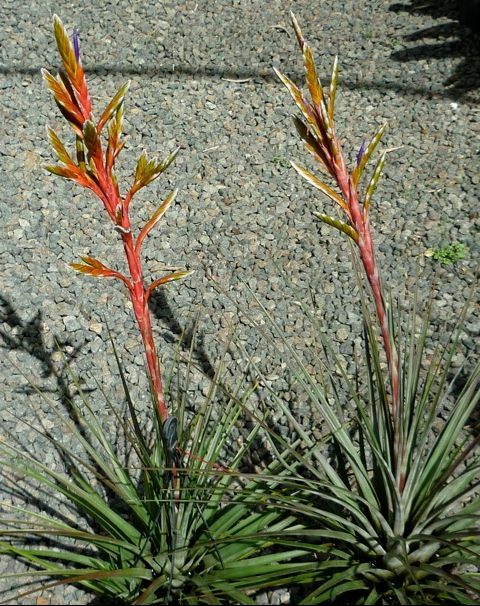 There are such a number of these "rodregueziana-ish plants that it is confusing. Hi All. Here are the images of the other T. tricolor for comparison. Chris et al. : I am happy for my name to be used but, I did not have much to do with this plant, which I purchased from Paradesia, other than bringing it to the attention of those Nutters who attended the TPI in April 2010.